Optimize your Google Chrome for Maximum Privacy with these settings. You're not always safe online. Google Chrome is the most widely used web browser in the world. Its wide popularity is because of its features and simple look. And to serve users further, it send some personal information to Google and it's not a good idea to have your personal data recorded without users permission. In my previous post we learned searching Google and Internet without Losing Privacy and in this post I'll show you how to optimize Google Chrome for Privacy. Also, to achieve maximum Privacy settings we might disable some interesting features of Google Chrome. Read this post carefully and apply settings according to your needs. If you'll connect your Google account with chrome than your data will be automatically synchronize your data and save it to Google Servers. If you don't want this feature than follow the following steps to disable this option. In the "sign in" section, click on Disconnect your Google Account. From the dialog box that appears next, Click Disconnect Account. If you're suspicious about the data which is stored on Google Servers through Chrome Sync Sign in to your Google account and go to this link to check the stored data. Click on Stop and Clear button from the Chrome Sync page to stop syncing and clear all synced data. Do you want the Sync feature but don't want to lose Privacy? With Chrome, you can encrypt all the synced data to make sure Google will not be able to read it. Follow the steps to turn on the encryption. Note: You must be signed in. Go to chrome menu and than click on Settings. Now, in the "Sign in" section click on Advanced Sync Settings. Choose "Encrypt Synced with your own Sync Passphrase" and create a new passphrase. 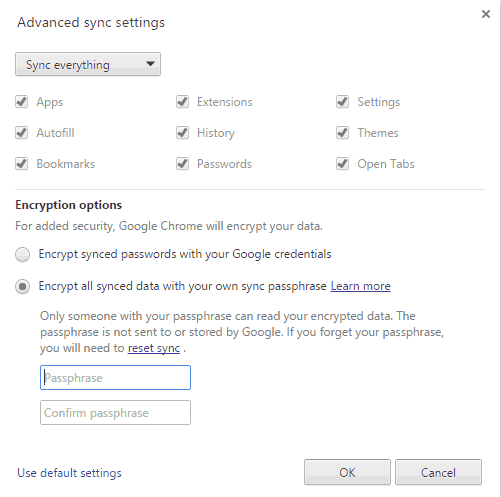 After enabling this option, you can sync Chrome data on other Computers only if you'll provide this passphrase, it can't be reverted. Tip: If you forgot the passphrase, than reset the sync. Go to the given link and click on stop and clear. All your Chrome synced data will be cleared from Google Server after the reset, but not from your PC or other device. The Privacy section on the settings page contains 9 different options. #1 When Chrome isn't able to load the website than it send the web address to Google and it sends search suggestion and related websites on its error page. You can un-check the navigation error option if you don't want Chrome to send website information to Google if they don't load. #2 When you type a URL address or search than Chrome displays suggestion related to the text you're typing. It can be from your history, web searches and popular websites. If you have set Google as your default search engine than it sends the input typed in the address bar to Google. Uncheck Prediction service for searches and URLs if you don't want these information being sent to Google. #3 Chrome can automatically look the IP address of all the links which is linked to from your current page. Chrome can load a new web page in the background if the website you're visiting asks for it. Uncheck the Predict Network Actions if you don't want to Chrome do this. #4 When you come with suspicious download or website than Google Chrome may ask you to send this information to Google if you check this option. Disable "reporting details of possible security incidents" option if you don't want Chrome to automatically send these information to Google Servers. #5 Google Safe Browsing downloads the list of some potentially dangerous website and if the website you're visiting is in its list than Chrome displays a warning. If you don't want to Chrome to send the website details you visit to Google than disable Phishing and malware protection. After disabling the, you'll not receive warning if you visit potentially dangerous website. #6 Chrome can check spelling of the text you type in the address bar. Chrome sends the text you type to Google Servers. If you don't want your typing information being sent to Google than uncheck Resolve Spelling Errors. #7 Chrome may send information such as your preferences, button click and memory usage if you encounter crash. It may also sent the website you visited if it is related to crash. If you're suspicious about this option than disable Crash Reports. #8 You can turn on the Do Not Track request with your browsing traffic. It doesn't mean that the website will not collect the information. None of the information is tracked with this option. #9 You can search or any other voice commands on Chrome by saying "OK Google". When you say "OK Google" while you're on Google Search page or a new tab page than an audio recording of what you say will be sent. Disable OK Google option if you don't want the audio being sent to Google. Click on the Content Settings button which is under the Privacy Section. Website you visit stores some data on your Computer to serve you better. But it might be used to track you online. Enable "Block-Third party cookies and site data" option to disallow Chrome from accepting third party cookies and site. Some website might not work properly. It is better to keep this option disabled. You can also set Chrome to delete browsing data and cookies after you quit browser, you might need to sign in to your Accounts on website if you enable this option. While you're browsing website, there are many companies tracking you online. You can install Adblock Plus on your Chrome browser to disable tracking. It is always advised to keep a good anti-virus or Internet Security software to keep yourself safe while you surf Internet.